Do you ever feel like you are living on constant adrenaline? There are so many things to do, people to please and deadlines to meet that you have completely forgotten to breathe, let alone eat? Instead, anxiety is quietly gnawing away somewhere inside you. The good news is that there are some simple tools to help. Next time you notice that you are feeling stressed, try one of these breathing tricks to find some calm. (Clue: your shoulders are up by your ears, you are virtually holding your breath and you are feeling frazzled). People who are long-term stressed are often chronically under breathing. This creates a constant state of low oxygen with a build-up of excess carbon dioxide. This is no good for mind or body. It is essential for your health that you can turn off the adrenaline occasionally. There is seriously no point eating all that healthy kale and quinoa if you can’t support your mind and body with a little CALM. The excess carbon dioxide encourages unhealthy inflammation in the body. The lack of oxygen to your brain and vital organs means you can’t possibly be functioning to the best of your ability. 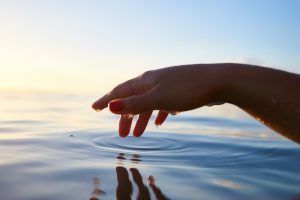 If you can find a little recovery space each day, it will also help you tap into your natural well of vitality that makes life so much more fun and enjoyable. 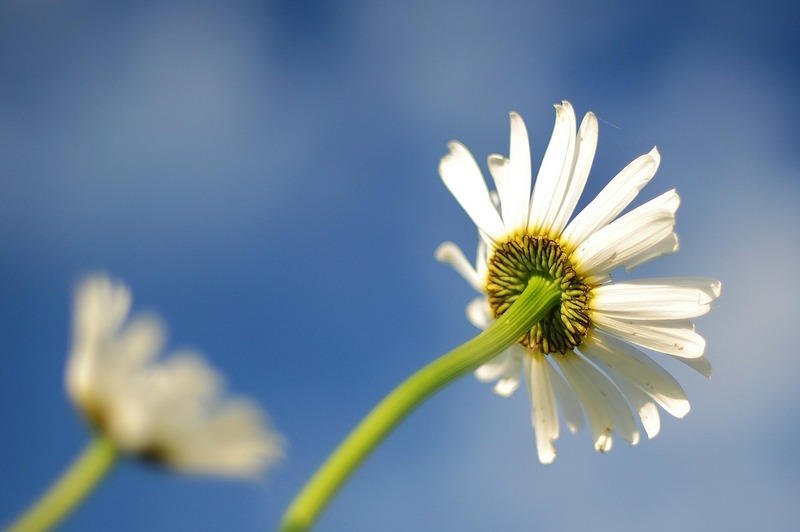 These 3 ways to find your calm all have BREATHING in common. Simple and effective, they take less than 5 minutes. kicking in the parasympathetic nervous system. This is the opposite of the ‘fight-or-flight’ adrenaline fuelled response. Deep breathing, (with a long, slow exhale), stimulates the vagus nerve into slowing heart rate and reducing blood pressure. This first trick you can try straight away. At work, home, in bed, on the bus, wherever. This very simple 4-7-8 breathing technique has been described as a natural tranquilliser for the nervous system. Based on yoga techniques, it is ideal for calming body and mind. The best bit of this simple tool is that it takes little more than 1 minute and can be done anywhere. With your mouth closed, breathe quietly and deeply in through your nose to a mental count of 4. Hold your breath for the count of 7. Slowly exhale through your mouth to the count of 8. Do this with slightly pursed lips, while making an audible sound with your breath. Repeat the above cycle several times. That’s it. No cost, no time, no special pose, no location. Just you and your lungs. To add some fun to deepening your breathing, go and blow some bubbles! Yes, take 5 minutes and remind yourself of the childish delight of blowing beautiful bubbles and releasing them into the breeze. You need to exhale all your breath through your mouth very slowly to make the largest bubbles without them popping. So this really should work to kick in your calm. It’s 5 minutes of quiet space that will put a smile on your face too. 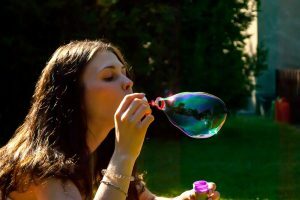 Use the same technique as the 4,7,8, above but this time blowing big beautiful bubbles. 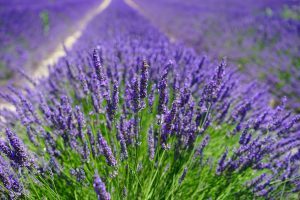 Essential oils are well known for their ability to de-stress. The quickest way to feel the effect of an essential oil is by inhaling the scent through your nose. This is because the smell centre in your brain is right next to the limbic system which deals with memory, instinct and emotions. First you need to choose appropriate oils that have a calming action. Frankincense, Vetiver, High Altitude Lavender or Roman Chamomile would all be good choices for a sense of mental peace. There are some further blend ideas here if you wish to blend your own. Neat on a tissue: Place a drop of neat essential oil on a tissue. Hold it near your nose and breathe in. Diluted on the back of your hand. Dilute a few drops of essential oil in 1 tablespoon of almond or olive oil so that it is safe for your skin. Massage into the back of your hands and neck and breathe in. You will smell the aroma every time you put your hands near your face. If you prefer not to make your own you can use a ready made blend. Aromatherapy Mood Shots ™ are handbag friendly, elegant and easy to apply on-the-go. 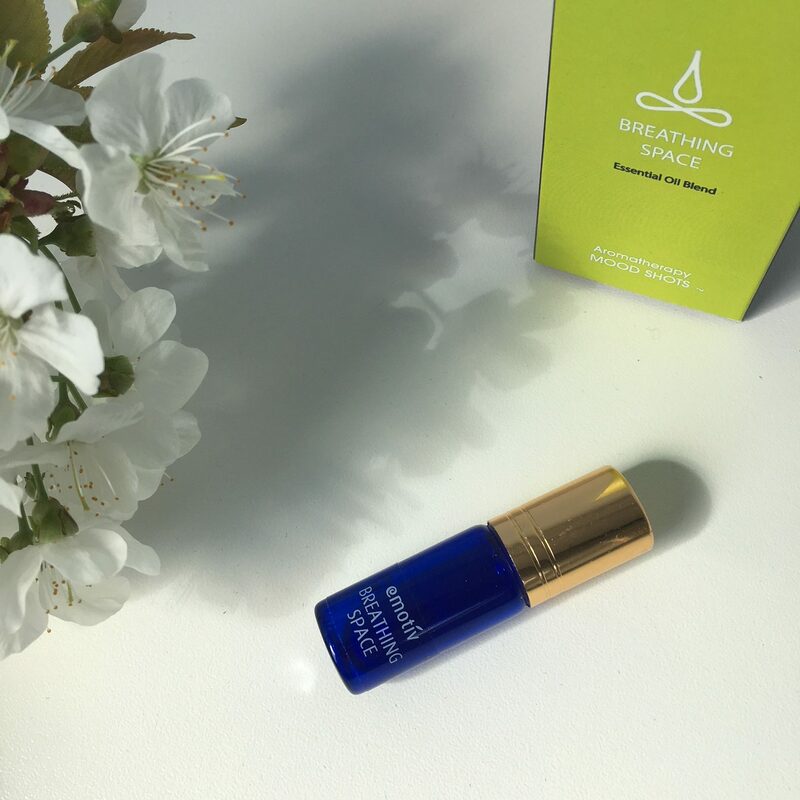 I would recommend ‘Breathing Space‘ for a calming blend. Whatever you choose, the inhaling part is vital. Mindfully create a 1 minute ritual to do this. Using the same breathing technique we just discussed, breathe in deeply through your nose while inhaling the aroma. Hold for 7. Then breathe all the way out through your mouth. Repeat 3 or 4 times, taking in the fragrance of the essential oils each time. If you have enjoyed reading this post and would like to be part of a journey to find your own INNER CALM, you might like to join my VIP mailing list. Every couple of weeks I share tools just like this exclusively with my VIPs. Tricks for finding your calm, aromatherapy recipes, breathing spaces in the city and lots of other self-care nuggets direct to your inbox. You will also be first to hear about occasional new products launches and events. If you decide it is not for you after you sign up, then you can unsubscribe at any time. Yes! please sign me up. I want to be part of the journey of calm and join your VIP mailing list. All recommendations on our website and social media channels are provided for general information purposes only and are not intended to diagnose, cure, treat or prevent any disease, or replace the advice of medically qualified professionals. This information should not be used as a substitute for medical counselling with a health care professional. Always seek the advice of a doctor or other qualified health professional with any questions you may have regarding any medical condition. 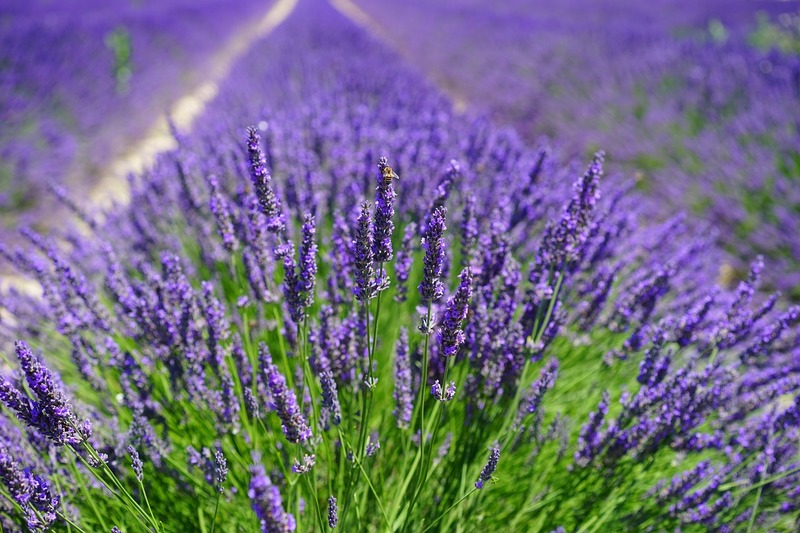 Essential oils are extremely potent and they need to be treated with great care and respect. It is always best to consult a qualified Aromatherapist for safety advice. If you have a medical condition or are taking any medication, consult a doctor before using essential oils. Never use essential oils undiluted on your skin. Never take essential oils internally. Some essential oils are unsuitable during pregnancy.